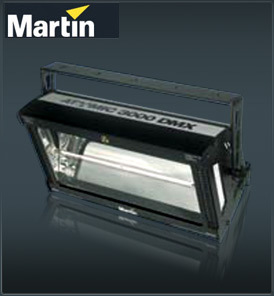 The Martin Stobes is a powerful, high-impact strobe with 3000 watts of unlimited energy. Like nature’s most powerful energy source, the sMartin Stobes is an ultra-bright, high-impact strobe that supplies an explosive pulse of energy to clubs, tours and mobile DJ’s of any size. The Martin Stobes is dimmable from 0-100%. Flash duration is controllable and for ultimate flexibility and variety of effect, variable adjustment of flash rate (20ms to 2 seconds) and flash intensity is possible. The Martin Stobes is both intense and intelligent. DMX controllable, it employs a smart, integrated heat control that eliminates the need for cool down time. Wrap your Martin Stobes effects in a wealth of color with the Atomic Colors - defining the effect to the moment.